Frontispiece from Erasmus Darwin’s The Temple of Nature (1803). 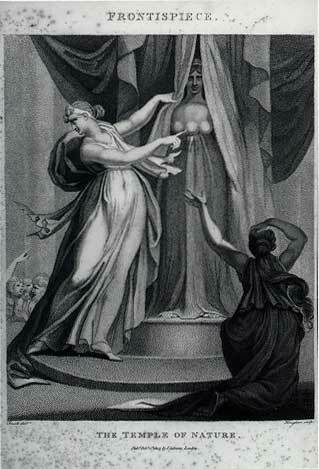 The image suggests the goddess of poetry pulling aside the veil to reveal the many-breasted Artemis of Ephesus, goddess of wild nature. Anthropologists have recently claimed that Artemis’s chest was actually covered with numerous bull’s testicles during worship ceremonies, signifying her complete–and bisexual–fertility. One tradition claims that the goddess said, “No on has lifted my veil”: “I am the Mother without spouse, the Original Mother; all are my children, and therefore none has ever dared to approach me” (Frazer, “The Golden Bough”). This form of goddess-worship was clearly one of the origins of the ideas of “Mother Earth” as well as “Mother Nature.” The original drawing for this engraving was by Henry Fuseli.